Is anyone else excited about the new and brilliant Cadbury’s Scream Egg? I was in a very silly, childish mood, my feet glued to the floor of the sweetie aisle in front of the Halloween section when I saw them. 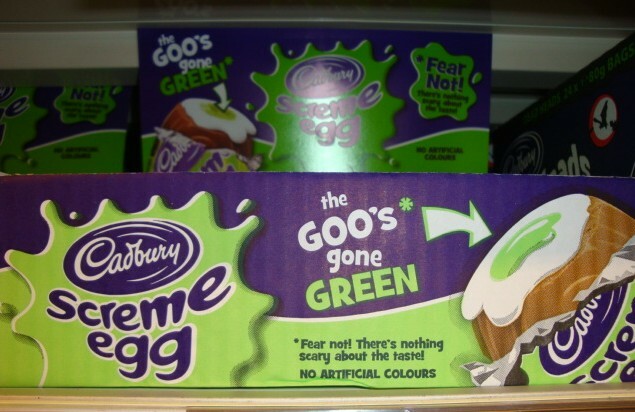 Not only have they the coolest name, they’ve also got green yolk. GREEN YOLK! What a genius idea. God I love Halloween, next to Christmas it’s my favourite occasion of the year. Actually, no, May Day sneaks ahead of it, but I do truly love it. I’m also a sucker for ghost stories and scary movies – I pity the poor dinner party guest with a childhood tale of poltergeists haunting their family home, or the slightly clairvoyant friend who occasionally wakes up to find a figure dressed in period clothing leaning over the bed staring at her. I am relentless, totally exhausting, fascinated like a 5-year-old, and I don’t stop badgering them for more and more juicy tales until they have literally fallen asleep mid-sentence. And as for horror films? The more terrifying the better. I prefer suspense to gruel although a good marriage of both is ideal. But the sad thing is that despite my grizzly cravings, even the scene in Jaws when the dead fisherman’s head pops through the hull of that little fishing boat, scaring the life out of oceanographer Matt Hooper, is enough to keep me awake at night. Anything more than that and I will refuse to even so much as go upstairs alone, and find myself jumping out of my skin at every little sound, and sleeping with the light on for days. Clearly I’m not cut out for this stuff but come Halloween I’m just supernaturally drawn to watch The Shining, or The Omen 3, even though I categorically know – it’s written in stars, carved out in stone – that after no more than 10 minutes I will be hiding under a blanket with my fingers in my ears, heart thumping, utterly petrified. And if I don’t switch channels immediately to something like say X-Factor, Corrie, or hell even the shopping channel would do, I’ll be so spooked I won’t recover until Guy Fawkes Night. Still, the sight of all that Halloween loot in the supermarket just fills me with a thrilling, chilling anticipation. I am also blessed to be the proud owner of the perfect Halloween recipe which I have cooked on October 31st every year since 1996 when it was first passed to me by my beloved friend, Tall Sarah. In her fabulous honour I’m going to share it with you my lovely readers. 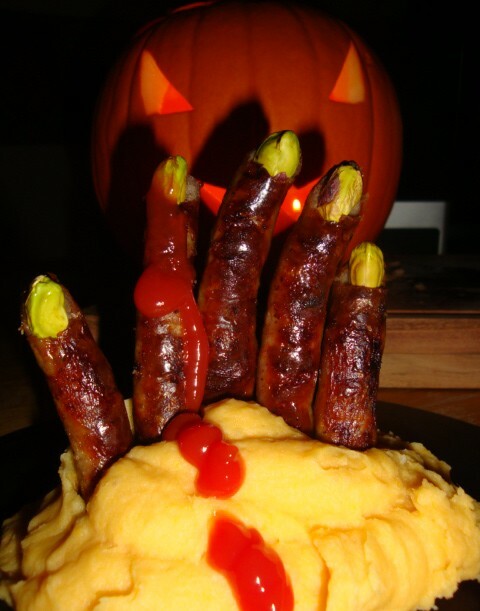 There are multiple reasons why this is absolutely the right dish for Halloween. 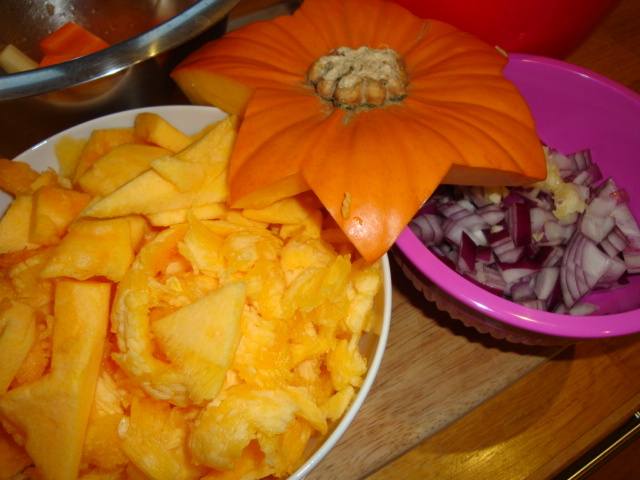 Its main ingredient is pumpkin and, well, you’ll have plenty of that kicking about after you’ve carved your scary lantern and it doesn’t matter what state the flesh is in as its purpose is to melt into the sauce making it gorgeously thick. It can be served in a bowl and eaten with a spoon so is perfect for standing-up party food. You can’t mess it up. Just can’t. And it can be made in advance and warmed up when you want it; Easy! This is best prepared by candlelight; shadows flickering spookily on the walls as you chop. 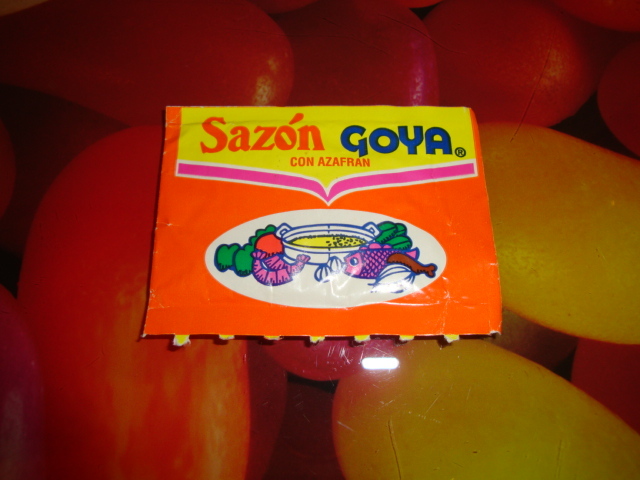 Sazon Goya - if you can find it get me some! In a very large, heavy-bottomed (a bit like myself) deep saucepan for which you have a lid, heat 3 tablespoons of olive oil and gently saute the onion and garlic till soft. Add the chicken and cook for a couple of minutes until it begins to colour, then add the parsnips and carrots and give them 4-5 minutes to begin to soften, season with salt and pepper during this time. Stir through a couple of teaspoons of your spice mix, then add 3/4 of the stock, and all the bacardi and lime juice. Next add the pumpkin flesh, squishing the squash down underneath the liquid, and bring to the boil. Turn the heat right down, cover with a lid, and leave to simmer very gently for at least an hour, after which time the lid can be removed to reduce the stock down to a rich sauce, or add more stock if the sauce is too dry. 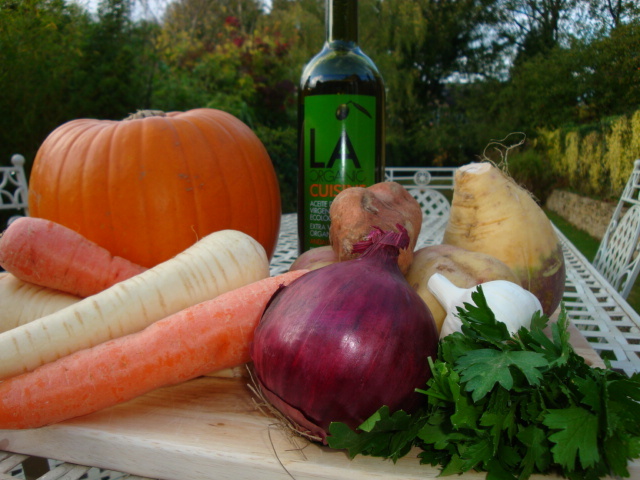 Cook until the pumpkin has dissolved into the stock to make a thick, stewy sauce. Check for seasoning; and you might want to add more lime juice to brighten it up. Meanwhile boil the potatoes until soft, drain, and mash. 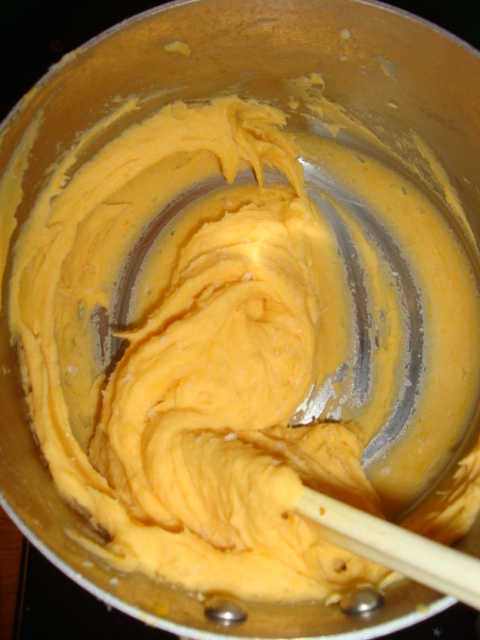 Then add lots of butter, salt and pepper, and beat the living daylights out of it with a wooden spoon until it is fantastically smooth and velvety. 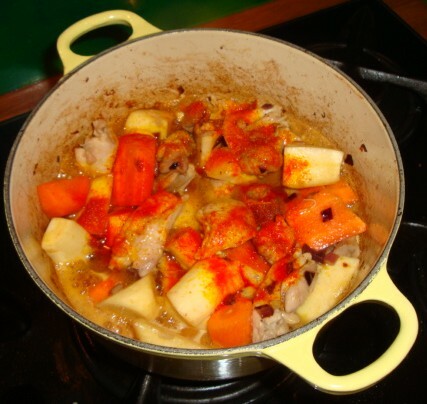 Take the stew off the heat a good 10 minutes before dishing up, which not only avoids greedy-guts like me impatiently taking the roof of their mouth off with the first spoonful, but also lets the flavours settle down and results in the whole thing being more enjoyable. 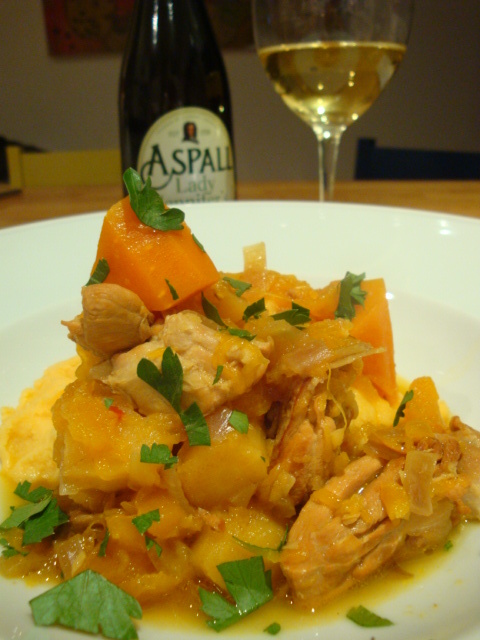 Serve the stew on top of mash in warm bowls, with a scattering of chopped parsley if you’re feeling fancy! Leftovers would make a brilliant Bonfire Night pie, topped with a puff pastry crust. 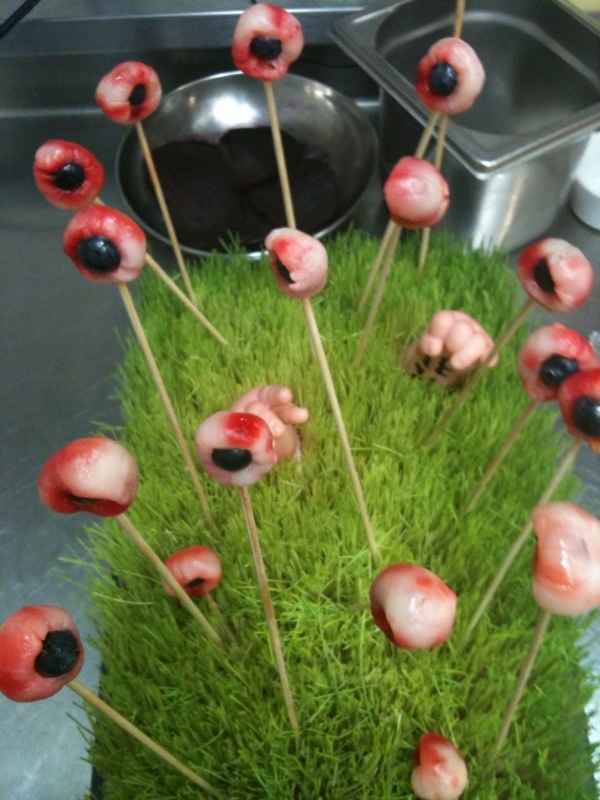 My lovely and profoundly talented, if scatty, friend Ollie, who happens to be a complete genius chef about to hit the big time with his new restaurant due to open in the heart of London next January, made some hilarious and inspired ghouly canapes for an event last year. 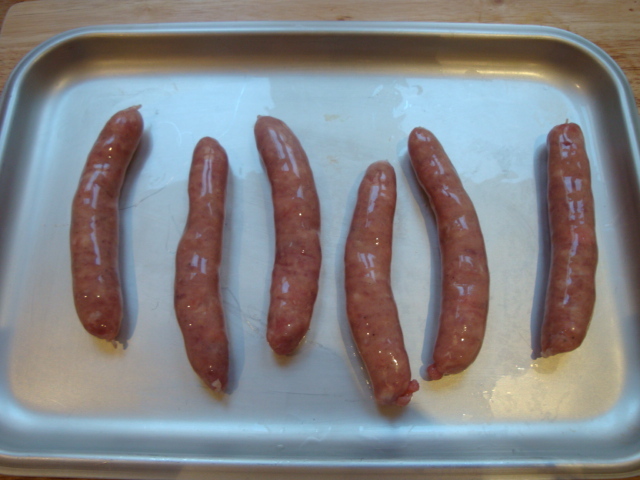 My attempt at ‘scary sausage fingers’ has now been put firmly to shame by his maggot garden, lychee eyeballs, and voodoo beef. Photos below. Aren’t they just completely brilliant? 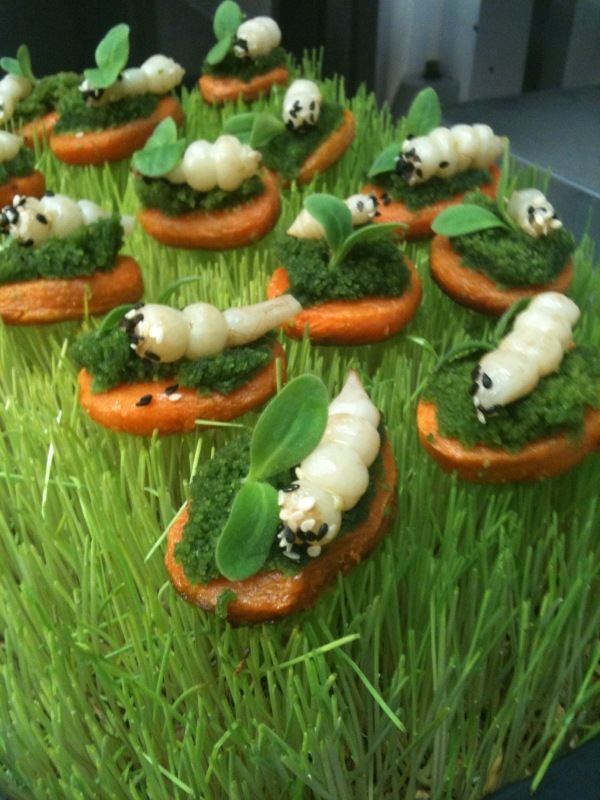 Pumkin fondants, sage moss, pickled crosne?! Roast beef with a miso rub and puffed rice. Sick! Burnt Alive; scary sausage fingers! 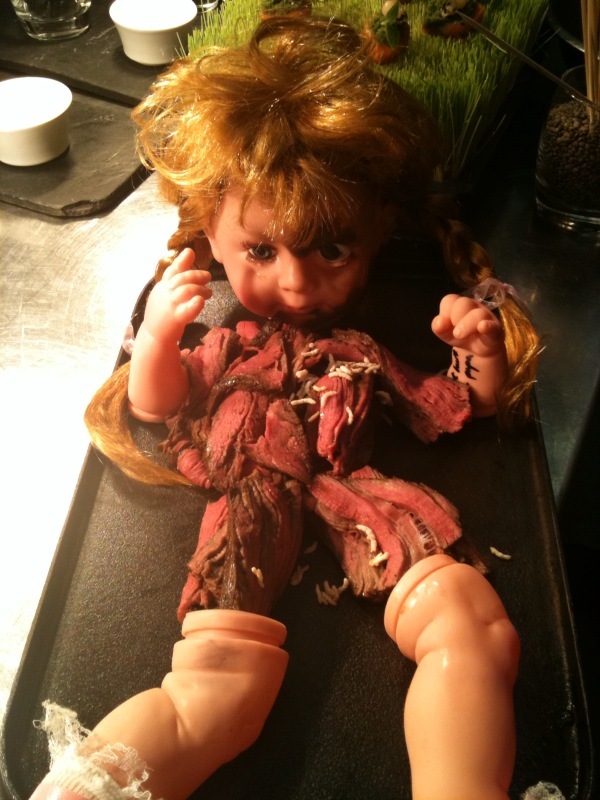 My favourite blogger, Not Quite Nigella (see my blogroll) recently made a gorgeously artistic ‘Graveyard Cake’ and ‘Rat Plague Brownies’, and my sister usually makes the real Nigella’s ‘Blood Clot and Snot Jelly’ and ‘Witches Hair Spaghetti’. Nice! So tell me, do any of you have a special Halloween dish you’re willing to share with me??? Brilliant! 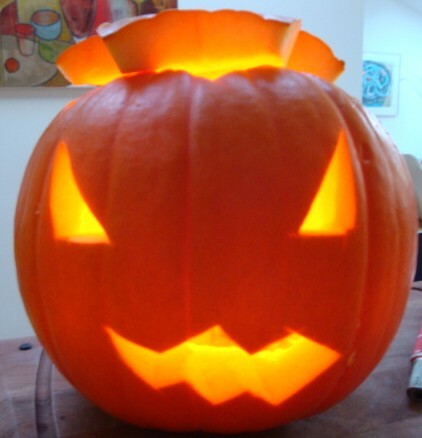 Going to get my Halloween lights up tomorrow & get carving my pumpkins! COOLIO!!! Can’t wait till HALLOWEEN and scary nights around the fire!! !